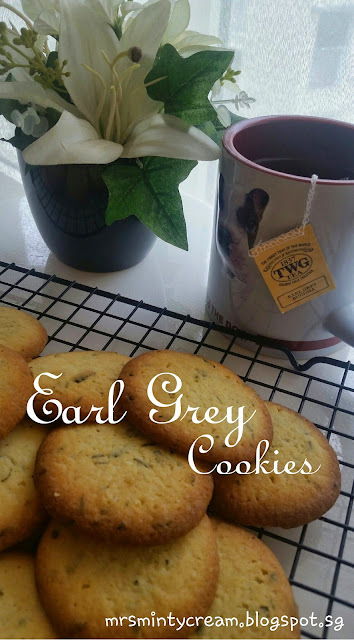 I bet you have had days when you are yearning to have something sweet and satisfying and yet, you don't have the whole afternoon to come up with fancy recipes to satisfy that craving. So, what do you do then? For me, when I was something quick, yummy and easy to fix up, I will always go to this recipe of mine. 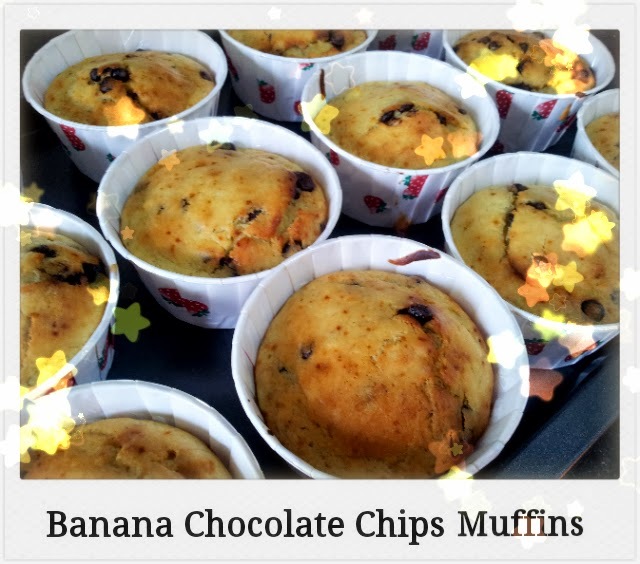 Simple Banana Chocolate Chips Muffins. The whole preparation and baking time takes less than 30 minutes. Incredibly easy! For me, I wanted the muffins to be kind of bite-sized to prevent myself from overeating, so I only filled up the muffins cups to slightly above the half-mark. If you want to a pretty muffin-looking one, you'll have to fill up those cups to at least three quarter of the way. Look at the batter before they go into the oven. Creamy, thick and with those polka dotty chocolate chips. Cant wait! Oh yah, I also added yogurt in my version of these Banana Chocolate Chips Muffins (different from original recipe) just because I wanted them to be more fluffy and richer in their taste. It actually paid off! See how much chocolate chips I have put in the batter? The whole muffin was filled with addictive chocolate chips. Not to mentioned, the sweet smell of bananas. The best bananas to use for this recipe are those that are over-riped. They may not look pretty on the outside, but when used in such baking recipes, they taste SO sweet and so heavenly! Yum Yum! 1. Preheat oven to 200C and line muffin tin with paper liners. Set aside for later use. 2. Sieve the dry ingredients (flour, baking powder, baking soda, salt, cinnamon) together and set aside. 3. Using a small bowl, toss the chocolate chips with 3 tbsp of flour. Once all the chocolate chips are coated in flour, set aside. 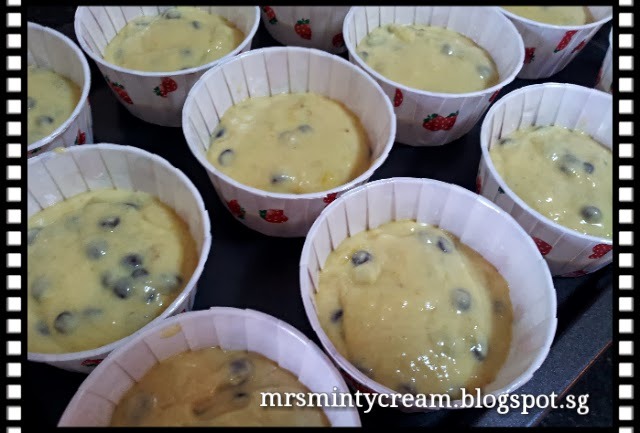 This will ensure that the chocolate chips will not sink to the bottom of the batter and will be able to spread well across the muffins. 4. In a separate bowl, mashed the bananas using a fork until you get a thick mash with small chunk of bananas in it. 5. To the mashed banana, add in the oil, eggs, sugar, yogurt and vanilla extract. Whisk these ingredients together using a whisk until they are well combined and a thick mixture is obtained. 6. Using a whisk, add in the flour mixture in Step (2) (1/3 portion at a time) into the wet mixture in Step (5). Switch to a spatula to help with mixing. Make sure that the combined mixture is well-mixed, with no trace of flour. Be careful not to over mix the batter. 7. 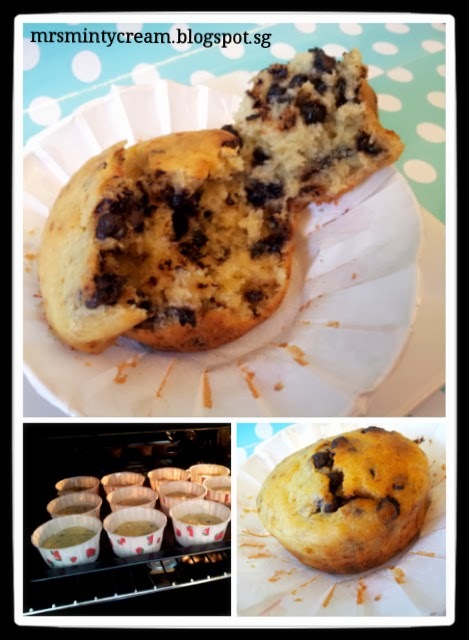 Fold in the chocolate chips into the mixture using a spatula. 8. Using an ice-cream scoop, divide the batter evenly into 12 muffins cups. Each muffin cup should be filled up to 1/2 to 2/3 of the way. 9. Tap muffin tray on tabletop and shake it gently to ensure that the batter is level and evenly spread out. This also help to make sure that any excess air is removed from the batter. 10. Bake for 18 minutes (turn the muffin tray front-to-back after 9 minutes) or until the top of the muffins become golden brown and toothpick when inserted comes out clean. Remove muffins from oven and cool in muffin tins for 5 minutes before transferring to wire rack to allow them to cool completely.